DIARY OF A PUBLIC SCHOOL TEACHER! : For Data's Sake! 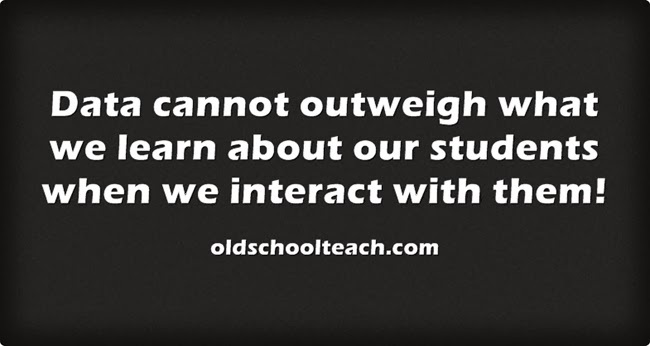 :Teaching Interruptus! I'm sorry. I am just a teacher who does not believe in testing fluency. I don't care what the research states. (Just my opinion) If you can read 200 words a minute and you don't know what you just read, what good is assessing fluency. Fluency good. Testing it, bad. But the point of all this is not to go off on a rant about ORFs or DORFs, but to point out how it is messing with my purpose. My reason for being in the classroom. I was told, no sorry, it was suggested that I DORF my students while they work on their Natural Disaster projects. Let's see, 20 kids, 3 minutes each, add in any interruptions that could possibly take place in a class of 20 5th graders, and that adds up to "too much time wasted giving a DORF test. " When my students are work, the majority of the time, I am involved. I am a facilitator, guide, sounding board, suggestion maker, I am there for the taking. So I figure if I am spending 3 minutes per child, assessing DORF, and yelling things like, "Don't bother me for 3 minutes, NO interruptions! ", I am not doing my job.. If every 3 minutes I say things like, "Ok, now you can talk to me until I start the next student", I am not being effective. I assessed 3 students and I couldn't do it anymore, I just couldn't. So yesterday, and today, I helped them with their projects. I read the work they had done so far, I showed them how to insert videos in their presentations, I introduced Thinglink, I praised the work they were doing, and I didn't assess. Of course, I am going to have to "get with it", and give those dang fluency tests, but at least I enjoyed the last two days giving my kids what they should have, my full attention! This so reminds me of Clint Eastwood in "Trouble with the Curve" where they try to replace an aging baseball scout blessed with people skills and intuition with the latest stats and computer technology. Another vote for your quote! While info can be helpful, there will never be a replacement for human interaction. Anyway, I could go on, but bottom line is, I appreciate and agree with your post! Hear, Hear! I totally agree! I feel that all we do is collect data, and add that to normal interruptions throughout the day, it's a wonder we get any teaching done. Love teaching, hate the data collecting so that some entity who doesn't know my children at all, can say that student A isn't passing because of some numbers on a spread sheet. I know it's impossible to expect them to be all knowing--but the folks in the up and up simply don't know our kids--their humanity. Not convinced all the mandated testing is an accurate representative of our students. When I was teaching in a Title one school running records used to challenge me too because there was no help. But later I moved to a better off school district and they were easy because I always had lots of parent volunteers. I found the data to be helpful to share with parents as proof I was doing a good job with their kid.